With the start of the New Year comes the promise of new armies, hobby projects and opportunities to get people involved or back into the hobby. I had the chance to do just that and get my friend Mikey, who tried once before to play Warhammer 40k,interested again. I jumped at the chance but soon realized that in order to make sure he enjoyed himself and stuck with it, it was important to take things in small steps. At first talking to Mikey he seemed quite interested in trying to start putting miniatures together and playing some games. 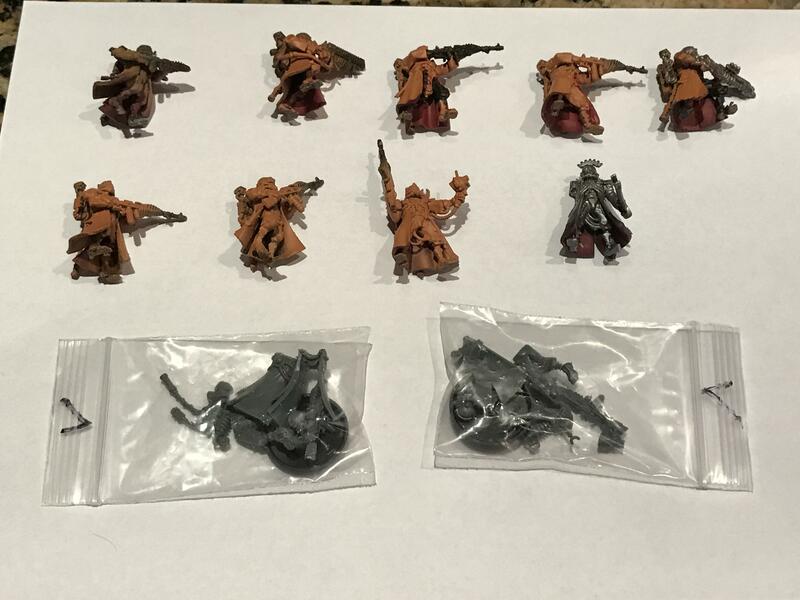 Back in the day, Mikey and I even went our local GW and he ended up buying an old school Blood Angels battalion box. Sadly due to little to no time to put them together or find time to play games, Sanguinious’ finest never graced any table top. With this in mind I quickly jumped at the idea of starting an escalation league between the two of us. Not quite the league you might find at your local gaming store but more a cooperative effort on both our parts to put miniatures, fully painted, on the table top and little by little, start playing. These type of joint efforts are great for new and returning players or even someone who lost motivation on a particular project. 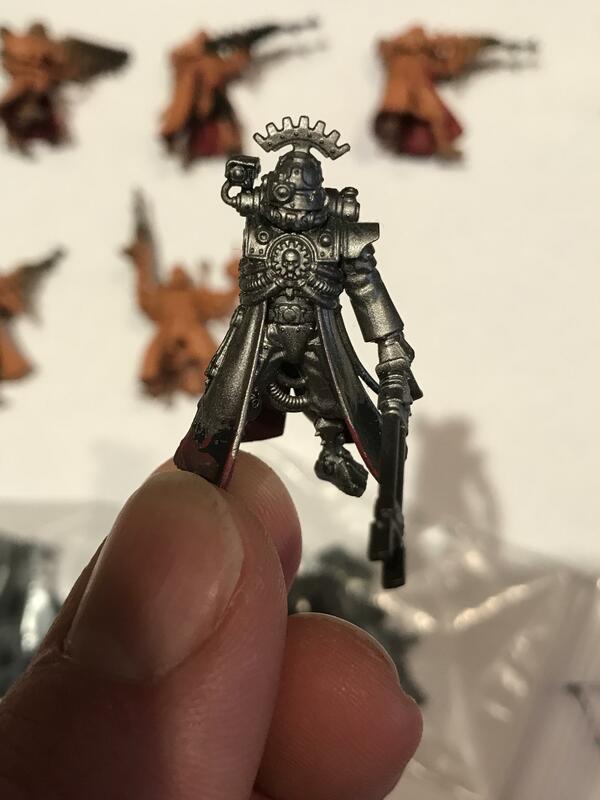 It gives the new person the chance to just focus solely one particular miniature or unit, learn the technique for putting them together and understanding painting and then get to play smaller games where any crazy variables are situations are taken out and the game can be played in a vacuum. I choose my skiitari vanguard unit, part of a larger force of Adeptus Mechcanicus that never saw much table top action but rather the inside of army cases and boxes. I chose this army because I distinctly remember how awesome I thought the lore and fluff behind them were and the colors of Forgeworld Ryza, with it rust oranges, jumping off pictures in White Dwarf and the codex. Thinking about why I chose the army in the first place definitely helped stoke the hobby blaze and helped strengthen my intents of finishing this army! Not only did this idea of starting unit by unit help me want to finish miniatures but it also helped Mikey open the box he bought so long ago. Soon we both hope to have a unit of Skiitari going head to head with a unit of tactical space marines. Without further a due here is my unit of choice- warning, unfinished miniatures. As you can clearly see, they range from base coat colors put down, to some missing parts to others not even being assembled. This is precisely why I choose them! They are miniatures I love and to take them from this sorry state to the table top is what it is all about ! I am very excited to start this project and share WIP’s of them to reasoning behind the next units I choose and even results of the games we play. 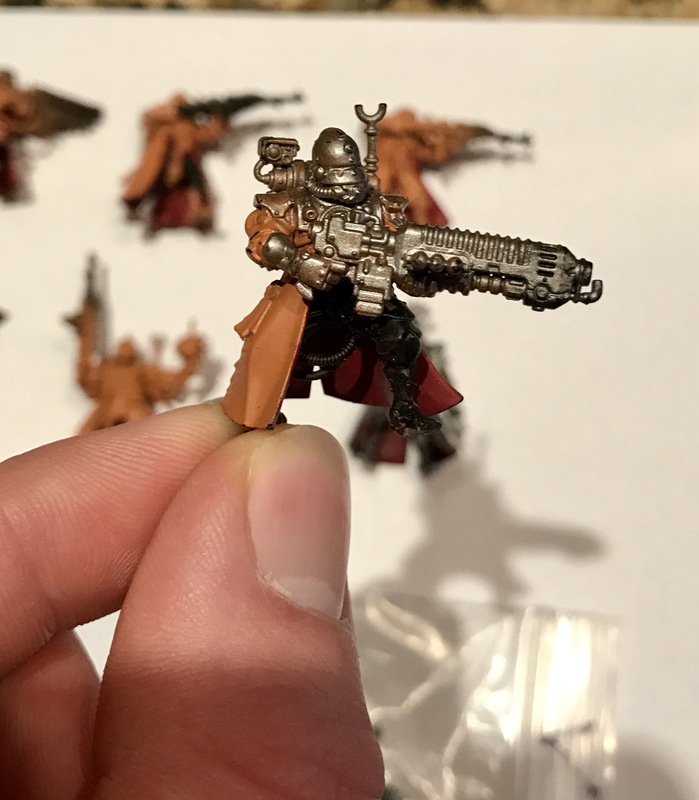 I really hope this inspires you and someone else you know to start getting their hobby on and finishing those miniatures!